ShutterstockA lack of commitment can lull renters into spending more recklessly than owners, says a new study. Consumers exhibit more reckless behavior when deciding to rent something rather than buy it, a new study out of the University of Maryland finds. 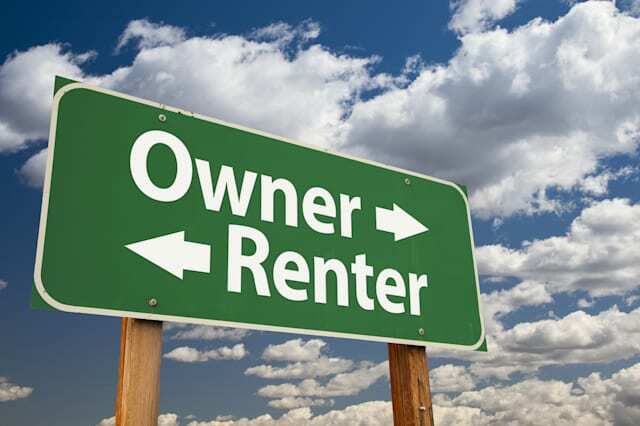 The lack of commitment required when deciding to rent a product leads people to consider fewer options, gather less information and settle for a less appealing product than they would when buying, according to a release about the study. Anastasiya Pocheptsova, the study's author and a professor at Maryland's Smith School of Business, worked with researchers from Columbia and Yale universities to conduct studies of people's behaviors while considering renting and buying the same products. Shoppers more often chose to buy when they had the choice of buying or renting, but when an item was presented only with an%VIRTUAL-pullquote-Buying a house requires asking a lot of questions, preparing your finances and doing extensive research, but it's smart to approach renting in a similar manner.% option to buy or only with an option to rent, more people chose to get the product when it was framed as a rental. The price of renting and buying was the same. "Completing a purchase can come with a sense of irreversibility that distresses shoppers concerned about the long-term consequences," Pocheptsova said in the news release. "Some shoppers anticipate buyer's remorse or worry about forgoing better options that might appear later." It seems approaching a purchase as a rental agreement strips away those concerns, increasing a shopper's willingness to spend the money. In the study, subjects were presented with advertisements of digital movie downloads and small appliances. Shoppers were more likely to get the products if renting was the only option, and those buyers displayed an interesting pattern: They acquired more things, collected less information during the decision-making process and took less time considering their choices before completing the transaction than shoppers with buy-only options. "Consumers should be mindful of their different modes of thinking," Pocheptsova said. "Standards of diligence vary, but a dollar is a dollar regardless of whether you spend it for renting or for buying." Not Being Committed Has a Price: Even if you don't rent consumer products like movies, appliances or furniture, the study offers a noteworthy lesson. Consider renting a home: Buying a house requires asking a lot of questions, preparing your finances and doing extensive research, but it's smart to approach renting in a similar manner. You could waste a lot of money if you don't think about the long-term affordability of renting your place. You may think, "I can find another apartment if this doesn't work out," but moving frequently is expensive, too. Failing to think through an item's value before you purchase it is fundamental to living within your means, because even small, unnecessary purchases can add up, potentially putting you in debt. One way to keep your spending in check is to track it -- it won't take you long to figure out where your money goes, and that knowledge will help you make smart decisions going forward. If you want to avoid or get out of debt, keeping a budget is the place to start. You can check two of your credit scores for free on Credit.com to see how your spending affects your credit.